Bonus exclusive content: 'Midis,chords,lyrics' folder contains midis complete with its own styles, chord data and lyrics. 15,000 PROFESSIONAL STYLES, MIDIS & MORE SPECIALLY CREATED FOR YAMAHA GENOS ARRANGER KEYBOARD. Vintage Hohner Harmonica Set of Five On Six Place Spinning Holder! 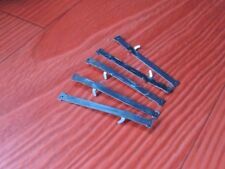 This is a set of five vintage Hohner harmonicas, keys of A,D,E,F and G on a holder that goes around the neck. One empty slot on the spinner. All are in working order, but I don't know enough about harmonicas to tell you any other information. 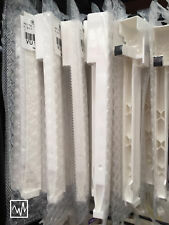 No neck band, but one should screw into each end of of the holder. Very cool set up! Add $8 for shipping in continental US. Hohner Pianet N - Vintage Electric Piano - Fully Refurbished!! Retroaktiv MPG-50. The MPG-50 is a compact 370mm (14.5") x 149mm (6") x 40mm (1.5"). Any incoming note, aftertouch, mod wheel, pitch wheel etc is automatically passed through the MPG-50 to the Juno. INVENTORY #35660. Thus preventing any possible "rack rash" or scratches. If it were a guitar pedal, avoid sticking Velcro on it and mounting to your pedal board until it passed your test to be knighted and sit at your round table of pedals. HOHNER CLAVINET 1 *Pro-Serviced* Vintage Clav- Sounds better than a D6! Rare Clavinet 1 for sale following a complete and thorough overhaul by Hammond Hire: this is a rare opportunity to buy a fully-functioning example of this early Clavinet dating from the sixties. This model sounds better than a D6! Antennas are nickel-plated 3/8" brass tube and cabinets are furniture-grade hardwood, finished black. Like the Ethervox, the Etherwave is an authentic adaptation of inventor Leon Theremin's original design. One solenoid rack for Pianocorder Player Piano this is the mounting rack only with the three brackets to piano. NO solenoids included. No other hardware included. Compact Synthesizer. Weight: 2.52 kg. Goose-neck micro and Xcite - Software Bundle. XLR Mic input for dynamic mics. MIDI I / O, USB, headphone output. Audio Line output 2x 6.3 mm jack (stereo L / R). This is so you can trap the foot of the jig under the SCREW (not the standard) to hold the arm in place . Final setting up can be done in the piano but this makes the general regulating so much easier ---------------------------------------------------------------------------------------------------------. Excellent condition Roland W-30. All keys, buttons and sliders work as they should. Includes original, heavy-duty power cable and about 250 floppy discs with hundreds of sound. Fender Rhodes 73 - CASE ONLY OVER 1000 more. PLENTY of PARTS for SALE . Pedal - Reproduction Cast Aluminum Fender Rhodes Sustain Pedal. LA VENDITA NON RIGUARDA NE FIANCHETTI LATERALI NE LA TASTIERA. Autoharp is in used, but beautiful condition. One string is broken. Item has a few small specs of dust underneath the perspex screen but apart from that in perfect condition. You may also need a power plug convertor. Play your sound creations on the high-quality keyboard with velocity and aftertouch. This jack board was removed from a working Motif XF6. INVENTORY #34115. FUNCTION: Performance Synthesizer. Also, keep the gear away from your friend with the Billy Ray Cyrus mullet driving the Camaro. Otherwise hardware and finish are in excellent condition. Available only at Nashville Gear Factory. "Because Music Should be Made with Gear!". Has all the tone and vibes you'd expect from a high-end synth. This is why we exist at Nashville Gear Factory. We are heart broken by the reality that children are growing up believing that music magically appears out of a robotic cylinder. If not disturbing others is a priority, players can use the mini-audio output jack to connect headphones to the MPK Mini Play. All-in-one, easy-to-use fun with “pro” features—that’s the MPK Mini Play! WALDORF - 2-POLE - Filtre Analogique. WALDORF - 2-POLE - Analogue Filter. Analogue filters have made a sincere impact in contemporary music over the past few decades and the powerful Waldorf 2-Pole Analogue Filter looks set to continue that trend with its award winning multimode filter technology. 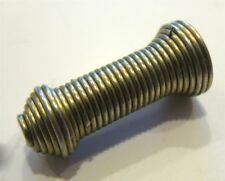 Lot of fender rhodes 3.5 long magnet pick up. Total 25 pick up, 15 complete, 10 just the heads. Referencia :KEYLAB ESSENTIAL 49 BK. Reference :KEYLAB ESSENTIAL 49 BK. Référence :KEYLAB ESSENTIAL 49 BK. 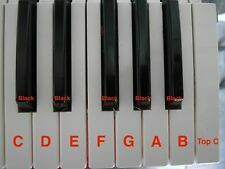 La musique est au centre de ce clavier de contrôle. Music is at the heart of the KeyLab Essential. Roland Jx3p w/ Pg 200. Near mint condition. Akai know that the touch and feel of your keyboard is everything! That’s why they have created a distinction between the ordinary and extraordinary keyboard! And the evidence is clear! Now be sure to enjoy the portability, without compromising the quality of the MPK 88. The smart streamlined design is perfect for playing sounds into your DAW. The Kontrol A49 is perfect for aspiring musicians and producers. The affordable yet premium-grade design features a best-in-class keybed with 49 semi-weighted keys for fluid playability. This instrument is awesome! Looks great for its age! All keys work. All buttons work. The two knobs work too. Volume lever works too. New startup disk arrived 08-24-17. New power cord. Turns on and boots on correctly. Just needs to get cleaned. 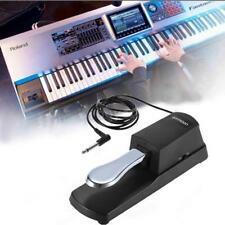 High quality Wurlitzer 200 series Sustain Pedal. Very durable design. Located in Kearny, NJ. This main board was pulled from a working QS-7. Le crossfader échangeable possède un contrôle Slope. Chaque canal peut être assigné à un côté du Crossfader. Le canal microphone séparé du M6 USB Black possède une prise XLR. La Numark M6 USB Black combine la flexibilité d'un mixeur 4 canaux avec les nombreuses possibilités d'une liaison USB. VG Condition. check picture to see condition. Very clean and in perfect working order. This is the inverter board for the Roland Fantom X8. This board was pulled from a working Motif XF6.